Breakfast. Brunch. Two of my favorite meals, as, often, they are excuses to eat items normally classified as dessert as a main course. And, two meals, where I'm totally not the food snob people generally think I am. Heck, I love the muffins from Costco, I find something strangely tasty about the scones from Starbucks, and, uh, I really like the cinnamon rolls from 7-Eleven. So when I visit my family in New Hampshire, going out to breakfast or brunch has become a thing. It seems far more likely that I'll find somewhere that makes good pancakes than, say, good seared scallops. And I have. While most of the dishes I've had at the very popular Lou's in downtown Hanover sounded better than they really were (although, swoon, they have such excellent sausage patties! ), I found pancake perfection the first time I went to the Hartland Diner (although subsequent visits were less perfect), and I discovered that the Danbury Country Store makes some excellent muffins. While I could have returned to any of those places and been fairly satisfied, it was time to find something even better. 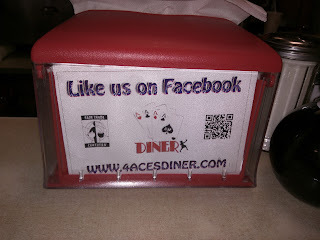 For a few years, I'd suggested visiting 4 Aces Diner to my mom, but she hadn't ever seemed too excited about it. She had been years ago, and, said it was nothing special. But, they changed owners at some point, and shut down for a few years, and reviews are now very strong. Also, um, they have crazy amazing sounding weekend specials. More on these soon. 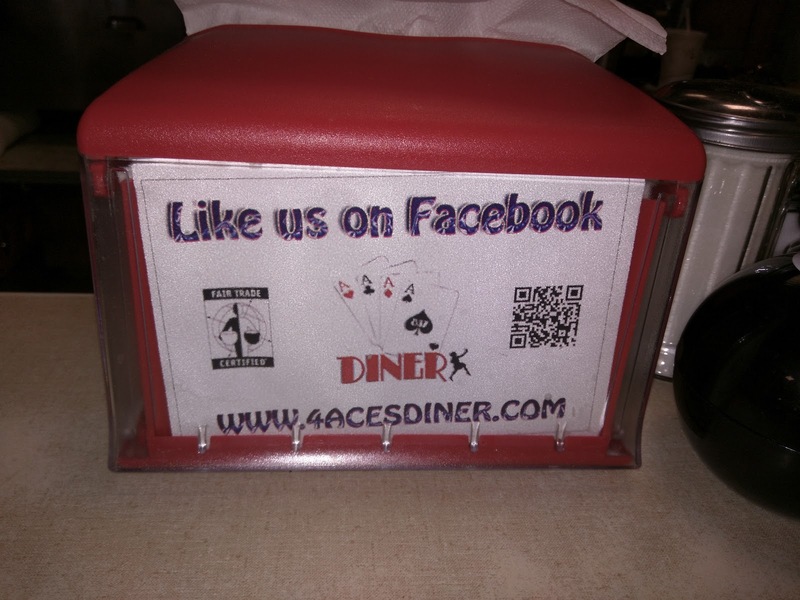 So, on my most recent trip, I decided to finally try 4 Aces Diner, after, literally, several years of trying to get someone to go with me. My grandfather loves going out to breakfast, so I invited him as well as my mom (although, he too had been before, years ago, and wasn't impressed), and we made our initial pilgrimage. Our visit was such a success that I went again two days later, again for breakfast, with my mom. And then the next day, for lunch, with my mom, dad, and sister. From the outside, the diner really does have some curb appeal. It doesn't look like a classic diner. It looks like a well maintained farmhouse or something, with nicely trimmed shrubs and beautiful hanging baskets of flowers. 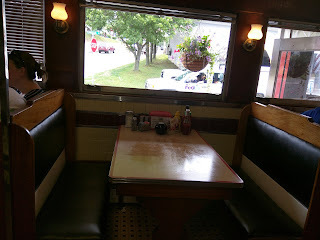 However, inside, it is actually a classic Worcester Diner Car (#837 to be exact), and has been in operation since 1952. 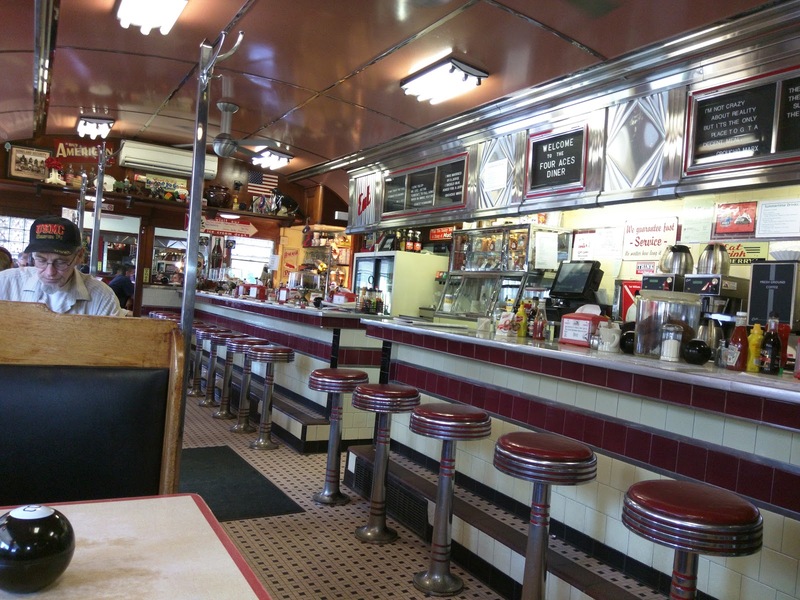 But once you step inside, it is classic diner all the way. 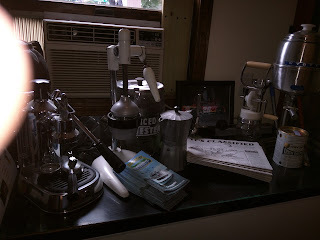 Counter seating, with old school bar stools. Tile floors. Booths. Shiny red seats. Vintage diner signs hang on the walls. A shelf houses large Mr. Potato Head figures. Let's just say, the decor gives you something to talk about. There are also a few booths for 4 people, but, they are in limited supply, and go quickly. On our second visit, we would have to wait for one, and, since no one looked remotely close to finishing their food, my mom and I opted for the counter seating to sit immediately. On our final visit, lunchtime on a weekend, the place was packed, and since we had 4 people, we had to wait. It took what seemed like forever, but was probably only 30 minutes or so. Every table (and counter seat) has a magic 8-ball on it. I feel like there must be some sort of story here, but, I don't know what it is. Again, a conversation piece at least. 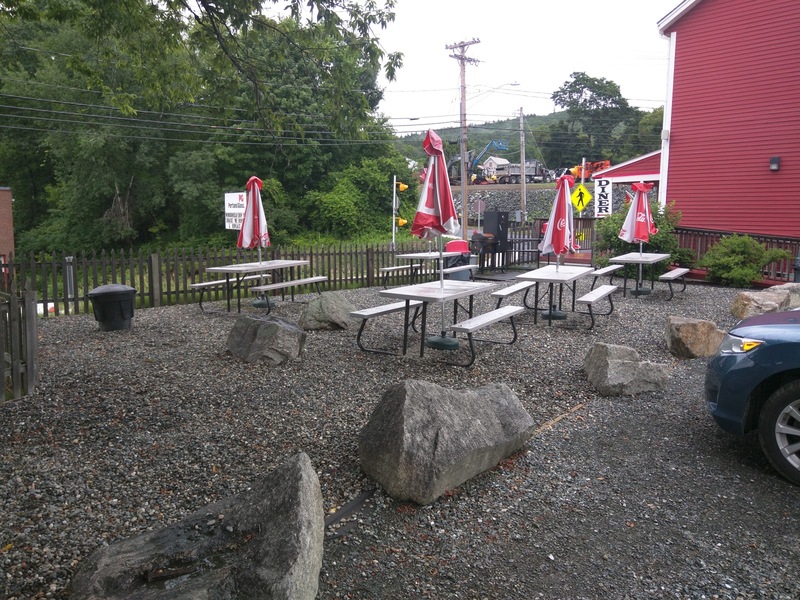 There is also outdoor seating, at picnic tables, on weekends only. Unfortunately, on the weekend we visited it was rainy, so we never got to see this space in action. I believe they BBQ out here in the summer too. Out back near the bathrooms was a really interesting assortment of old coffee makers, tins of oatmeal, and flyers for cruises and classified ads. Random? The juxtaposition of modern and classic throughout the diner amazed me. 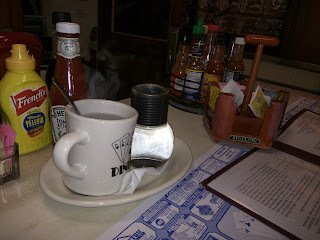 Crazy old school elements abound, and then, the napkin holders have their website, a Facebook mention, and a QR code. Condiments on every table include ketchup, sriracha ketchup, classic French's mustard, and malt vinegar. 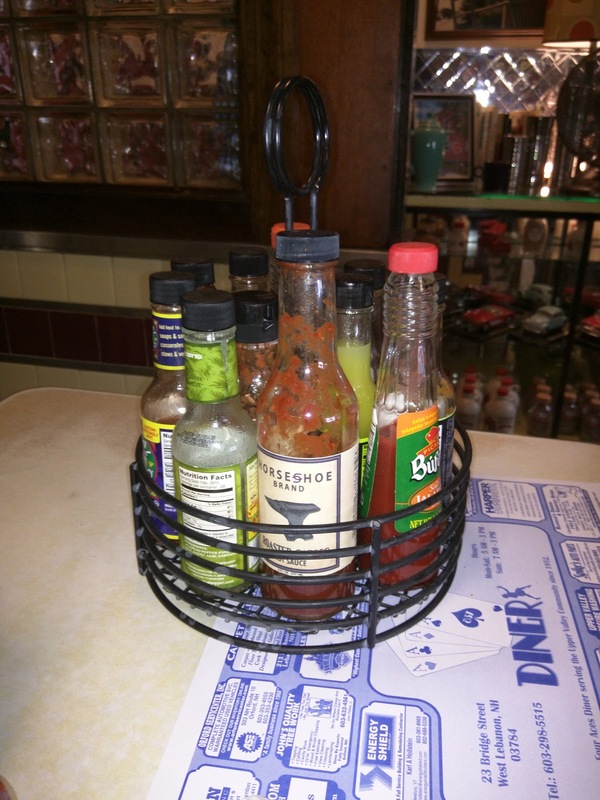 Staggered throughout the room are condiment holders with more options, basically, every hot sauce known to man. Seriously. Quite the selection. Anyone who wanted the extra sauces kinda just grabbed them when they wanted. It added to the friendly, communal atmosphere. The only item I used was the sriracha ketchup, which was actually excellent, and jazzed up my dishes quite nicely. “Big D” Sour Cream Doughnuts. 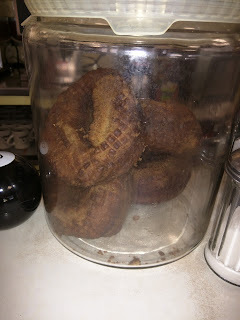 On the counter, in large glass jars, are the signature "Big D" doughnuts. They are more than just "big". I wish you could see the scale here, but seriously, as big as a dinner plate. And how do they serve them? Griddled, with warm maple syrup and whipped cream on the side. Seriously. Over the top. I didn't get a chance to try one yet, but, sometime when I visit with a larger group who'd like to share one, I'm up for it. 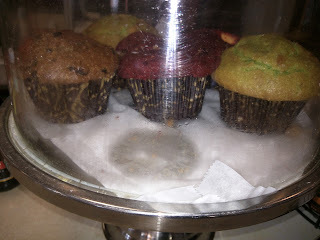 Also on the counter, in glass displays, are house made muffins, all different varieties, including a vibrant green pistachio one, a red velvet loaded with chunks of cream cheese that totally classified more as a cupcake than muffin, an amazing looking french toast one, and simple chocolate chip. As soon as we sat down, plastic menus were provided, along with paper placemats with local advertisements on them. I can't remember the last time I saw this kind of placemat! The menu is huge and options abound. For breakfast, egg lovers have a slew of omelets, benedicts, and breakfast sandwiches to choose from. The choices just for what kind of bread to have your breakfast sandwich on are overwhelming, with house made biscuits, english muffins, Portuguese muffins, rolls, and waffles in addition to standard sliced bread choices. Carb lovers can pick from a variety of pancakes, french toast, and waffles, all of which can have mixins added (or, uh, ice cream on top). Healthier types can go for oatmeal, granola, fruit, yogurt, or smoothies. Combo meals abound, not only mixing together items I have already mentioned, but also including classics like country fried steak, red flannel hash, bubble & squeak, even a breakfast poutine. Even the side dishes list is ridiculously long, with meat options extending far beyond just bacon or sausage to Irish Bangers, Kielbasa, Chorizo, and Bratwurst. Heck you can even order just a side of hollandaise! They offer not one, but two types of cornbread, one spicy. Weekends bring even more options, with a slew of specials. These can be anything from fresh popovers with maple butter or homemade donut holes with cinnamon honey, to the omelet or Benedict of the day (with crazy items like pot roast included), to their "famous" Back Yard Barbecue items, like baby back ribs, Texas brisket, "blazing saddles beans", and jalapeño corn bread and Moonshine BBQ sauce, oh, and a “TOT-CHOS Bowl”, described as "Tot as in Tater & Chos as in Nach: Sweet & White Tater Tots topped w/ Sausage Gravy & Sharp Cheddar Cheese, 2 Eggs Your Way". If you prefer lunch, then, you have pages of options too, ranging from soups and salads, to sandwiches (classic deli sandwiches, patty melts, fried haddock, etc), to burgers and hot dogs, to entrees like roast turkey with stuffing, mashed potatoes, gravy, and cranberry sauce, meatloaf, mac and cheese (with optional hot dogs or kielbasa mixed it! ), and fish & chips. Sides include hand cut fries (plain, creole), onion rings, sweet potato fries, cole slaw, mashed potatoes & gravy, pickled beets, and more. Of course, weekend specials abound for lunch too, including lobster salad rolls, fried scallop rolls, burger specials with things like bacon jam for toppings, and all sorts of fried appetizers like fried green tomatoes with "boom boom" dipping sauce or poutine. Oh, and if that isn't enough options, the menu also proclaims in big letters: "Want something you don't see? Just Ask!" I love that they let you make up your own meal, ordering basically anything a la carte, or combining anything you know they have. On my first visit, we arrived at about 10am, midweek. We were able to easily snag a booth. Service was good, we were offered drinks quickly, our mugs were kept refilled, and our server was pleasant, although not very engaged. I really struggled with deciding on what to order. 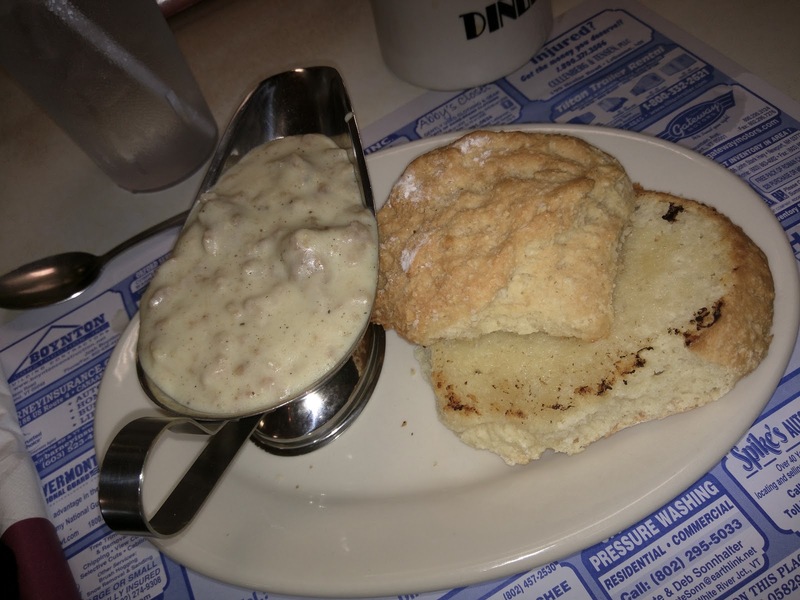 My favorite savory breakfast is a biscuit with sausage gravy. I love sausage patties. I read many great things about their pancakes. And I wanted the huge grilled donut with whipped cream and syrup. And the fresh muffins I saw on the counter. I wanted it all. In the end, I decided I'd get the biscuits and gravy, because my mom made pecan sticky buns the morning before, and strawberry shortcake the night before, so I had plenty of sweets, and knew I had more coming. So I ordered the biscuit, only to be told that they were out of sausage gravy. Doh. My plan was foiled. I decided to be complicated, and see what happened, ordering off-menu. The menu said to just ask for what you wanted after all, right? White Mountain Coffee, 4 Aces Blend. $1.79. Within moments of sitting down, our server approached with menus and offered us drinks. I followed my grandfather's lead and opted for coffee (regular, black) and a water. 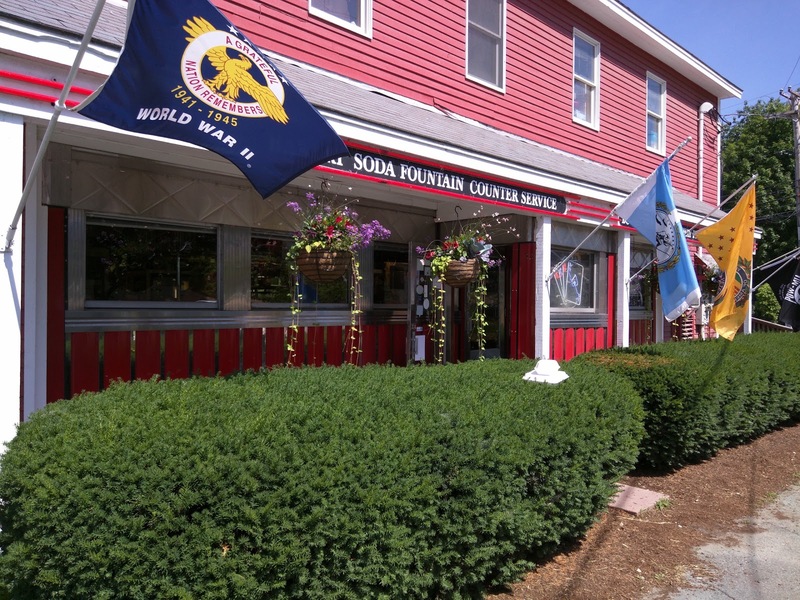 The coffee is from White Mountain Coffee, based in Concord, NH, and is a special blend for the diner, available in regular or decaf. It came served in a very sturdy, large mug with the 4 Aces logo on it. 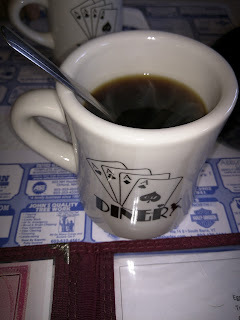 As soon as my mug neared empty, our server was by our sides refilling, but I opted to switch to decaf at that point, knowing that otherwise I'd consume way too much caffeine. She said no problem, and quickly returned with the decaf. I wasn't charged differently for switching out my beverage choice. The decaf was also pretty decent. The $1.79 price for unlimited, good coffee was good. My mom opted for tea, and was presented an entire tea carousel with Bigalow teas to pick from. On her second visit, she was also given an extra container of hot water to brew her next mug, but, on the first, she was not. Other drink options included juices and soda, along with diner classics like frappes, root beer floats, and flavored milks. Summer drink specials included flavored ice coffees and lemonades. 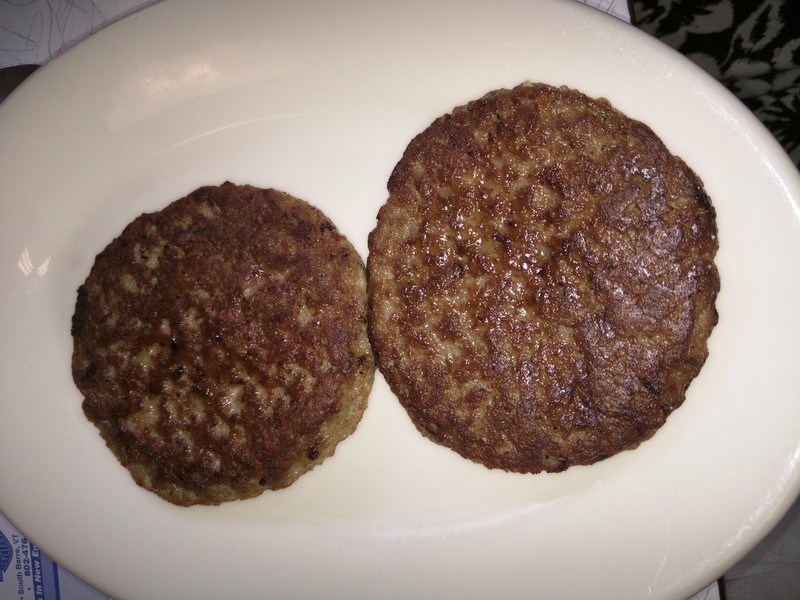 Since I couldn't have the sausage gravy, I opted for a side of sausage, knowing it was patties, my favorite (seriously, I'm not a sausage eater in general, but, breakfast patties I really do love). The side portion came with two patties. The patties were a thin style, well prepared. The sausage wasn't particularly flavorful however, and the texture was a little bit mushy inside. It was fine, but, fairly generic, and not nearly as good as the sausage patties from Lou's. That said, I enjoyed them with syrup, or, when combined with a bite of my sweet pancakes. I really love the sweet and salty, savory combo. The other breakfast meats (Irish bangers, kielbasa, chorizo, bratwurst) all list that they are from North Country Smokehouse, and the sausage did not. I think that must mean that they use a more common generic sausage instead? Anyway, it was fine, and the price for two patties was fine, and I'd get it again if I was really craving sausage, but it wasn't otherwise remarkable. "Buttermilk Pancakes w/cinnamon swirl & icing, served w/whipped butter." I decided to get a pancake, my fall back option from the biscuits since there was no gravy (not really a hard fallback, as I was pretty tempted to get this anyway). Pancakes normally come as a stack of 3, but, I didn't want 3. I wanted just one. So, I asked for one, and it was no problem. Pancakes are available plain, or with any mix-ins you want (whatever fruit they have available, or chocolate chips, white chocolate chips, craisins, or nuts). 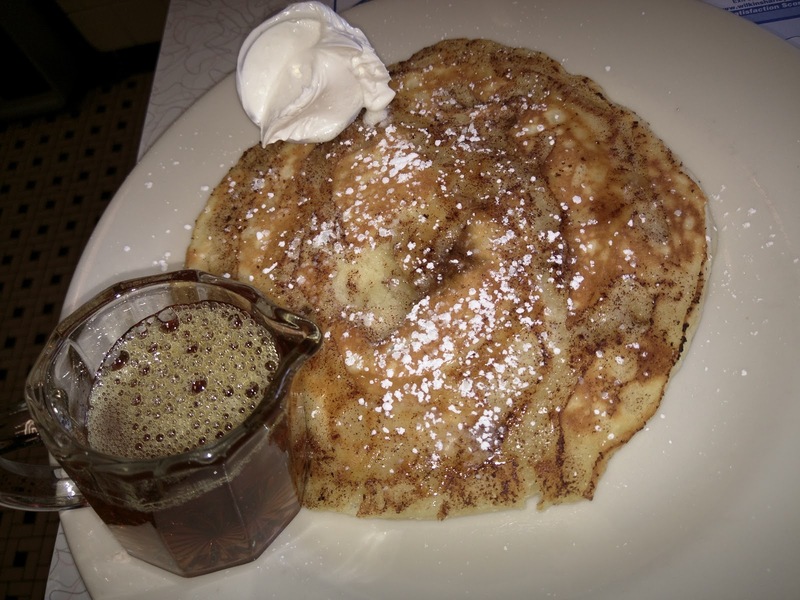 The menu also calls out two particular specialty pancake options: the "Pure Rhapsody" with raspberries and white chocolate chips, or, this, the "Cinnamon Roll Cake". Both sounded great, but the Cinnamon Roll version is the one I read so many rave reviews of, so, I went for it. The menu didn't even bother mention that the pancake came with syrup, but, it did, and came with its own glass pitcher of real maple syrup, served warm. Also on the side was a carton of whipped butter. From these elements alone, 4 Aces won a lot of brownie points from me. I hate it when places put the butter on the pancakes directly, and it all melts in before you can choose how much you want. Or, when they serve rock solid foil packets of butter, that totally won't melt on. The whipped butter was perfect, super soft, fluffy, and it melted in perfectly. The syrup was good too, classic maple syrup, real syrup, no upcharge for that. The pancake was excellent. The texture was great, fairly fluffy, well risen. 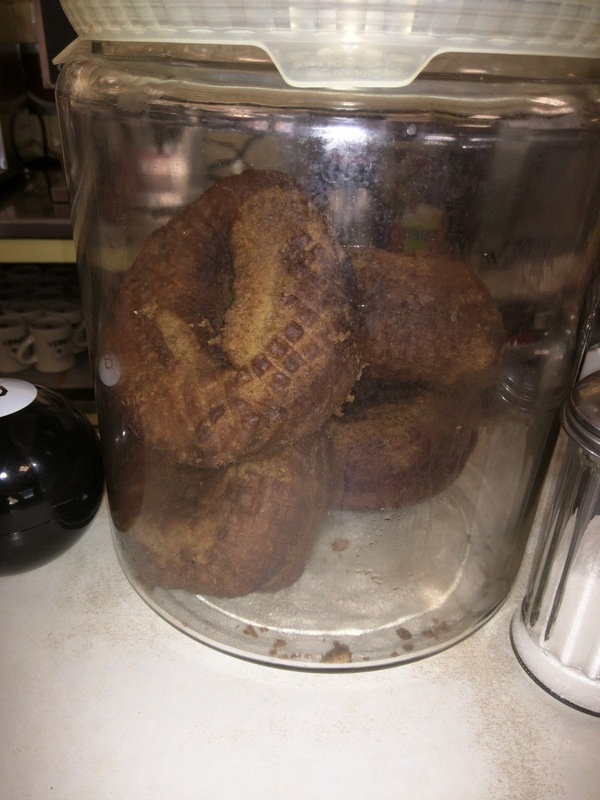 It had a good base flavor, a bit of tang from buttermilk, and, as you can see, tons of cinnamon swirled throughout. A sprinkle of powdered sugar on top completed the deal. It was also quite large. How does anyone eat 3 of these in one sitting! Sure, it wasn't huge like the Hartland Diner pancake, but a pancake and side of sausage was more than enough food. I'd gladly get it again, or, more likely, opt to try a new flavor, just to see if they can make others as well. I do love melty white chocolate chips in my pancakes. Or maybe I'd go for the full stack, and split with someone (or plan to bring home leftovers? ), so I could have the icing on top too (the icing seemed to be left out when I ordered a single). I'm not sure what the price of my single pancake was (I forgot to look at receipt), but a full stack of 3 would have been $7.99, so, I think the price was likely quite reasonable. Eggs Benedict, Florentine, Homefries. $10.99. "Grilled English muffin topped w/Baby Spinach, Tomato & Feta Cheese, 2 Poached Eggs & Hollandaise Sauce." My mom, per usual, went for a benedict, the florentine. She may have been drawn in by the menu claim "We Are the Upper Valley's Eggs Benedict Authority." Says who? Well, says my mom too. She said it was the best benedict she has had in the area. The english muffin seemed to be homemade, it was larger in diameter than standard muffins, and, she said the texture was like that of homemade. The eggs were poached perfectly. But it was the hollandaise that she kept raving about with each bite she took, saying how it was better than the hollandaise at this place or another. Eventually my curiosity got the better of me and I stole a bite. It really was great hollandaise, really well balanced, not too eggy, not to lemony, very creamy, thick, but in a good way. House made muffin, perfectly poached egg, and excellent hollandaise? Seems like a winner to me, and it almost made me want to like eggs. 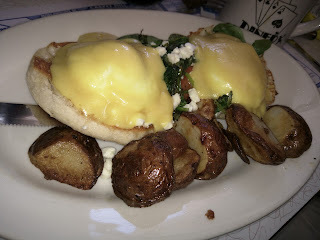 Her benedict came served with a small portion of homefries, the chunky potato style. They weren't particularly seasoned, and had no chunks of other veggies, but were well cooked. She liked them much more once she added salt and pepper (both available on the table). My grandfather opted for a classic breakfast with toast, 2 eggs over easy, sausage, and hashbrowns. I didn't take a photo, nor steal bites from him, but his eggs looked prefect as well, and the sausage and hashbrowns were the same as the ones my mom and I had. Two days after my visit with my mom and grandfather, my mom and I returned. I enjoyed the first visit so much, and this time, and I wanted to finally get to try that gravy and biscuits I had my eye on the first visit. We arrived around 9:50am, on a Friday, and it was quite busy. All booths were taken, and, tables didn't seem to be finishing up. So, we opted to sit at the counter. Within a few minutes, a line formed at the door, and groups were waiting the rest of the time we were there for tables. Busy place! Service at the counter wasn't quite as good as at the booth, but I think this was mostly because our server was just so busy. She didn't bring any straws when she brought our waters, and, never came back nor looked our way during the meal. She didn't seem to know the menu very well, not sure exactly what was available (like the cheese my mom ordered) or my request to have gravy on the side. She wasn't particularly friendly or personable. Still, we were taken care of in a reasonable amount of time, our food was delivered piping hot, and our drinks were kept filled. Biscuit. $1.29. Side of Sausage Gravy. $2.50. On the "Hearty Breakfast" menu is the sausage gravy & eggs, which is a biscuit, sausage gravy, 2 eggs, and homefries, for $5.99. However, I didn't want eggs or homefries, so, I just asked for the parts I wanted, which they were easily able to do a la carte. I also asked specifically to have my biscuit split and griddled (I have no idea if they normally do this or not) and for the gravy on the side. I wanted my biscuit warm, and, I wanted to hedge my bets in case I didn't like one element or the other, so I could eat them separately if necessary. I also asked for a side of whipped butter, thinking I might like the biscuit better that way. The biscuit was a huge disappointment. It wasn't crumbly. It wasn't buttery. It didn't have any buttermilk tang. It wasn't really a biscuit in the sense that I was looking for. Heck, even Bisquick biscuits have more going for them than this. I tried it with the gravy. I tried it with the butter. I tried it with butter and jam. 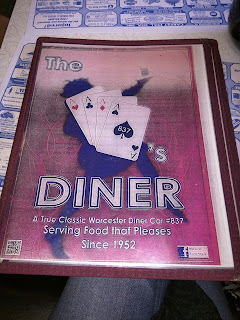 Sadly, like the Hartland Diner, 4 Aces only had Smucker's jam packets on the table. Nothing housemade. Lou's still wins in the jam department. This biscuit just really had nothing to give. 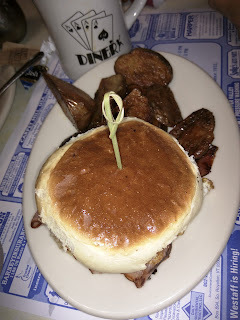 The Hartland Diner biscuits were much better. I didn't want this. I was about to order a muffin instead, but, my mom offered to switch with me. More on that soon. The gravy was ok. It was very thick, and loaded with chunks of sausage. It didn't seem to be the same sausage as the patty, as these pieces had a bit of texture to them. The chunks were nice sizes and pretty good. However, the gravy was seriously lacking seasoning. Virtually no salt and pepper. So, a bit lackluster to start, but, once I traded bread components with my mom, added pepper and sriracha ketchup, I enjoyed it enough. I wouldn't get a biscuit again. I would consider the gravy, but only if I really wanted gravy, as it wasn't particularly great. The Basic Breakfast Sandwich + Ham + Feta on Portuguese Muffin. $4.59 + $1.50 + $1. Side of Home Fries. $2.49. My mom opted for a breakfast sandwich: a fried egg on her choice of bread (English muffin, biscuit, 1/2 waffle, any kind of toast, King Arthur Flour Roll, or, a Portuguese Muffin). She picked the Portuguese muffin. She also added ham for an additional $1.50 (other options were bacon or sausage) and feta cheese ($1). The cheese choices listed on the menu were strange, only feta, goat, bleu, or colby. She actually ordered colby, but the server told us they didn't have colby. My mom pointed it out on the menu, so she went to check, but, returned saying no colby. So, only feta, goat, and bleu cheese? Nothing melty? It made no sense, particularly since I know they have American or Cheddar cheese for the burger, Swiss for the Patty Melt and Reuben ... maybe they were only listing the more interesting cheeses and assumed you'd know they had the basics? The egg was fried, fully fried, no gooey yolk. That seemed less than ideal to me for a breakfast sandwich, but, my mom liked it. The feta was fine, but she really wanted melty cheese. I question why she didn't ask for a melty cheese, but, she said they weren't on the menu. She really could have had melty cheese! As for the ham, she left a ton of it behind, saying there was too much. The egg, the feta, and the ham were of no interest to me, as they aren't elements I like anyway. But I was curious about the Portuguese Muffin. My mother, being a mother, offered to swap her Portuguese muffin for my biscuit. She was so excited for her Portuguese muffin that I felt bad taking the whole thing, so we swapped half each, just changing out the tops. She took a couple bites of my biscuit, discarded it, and ate her sandwich open faced. We agreed on that worthless biscuit. I enjoyed the Portuguese muffin more than the biscuit. It was buttered and grilled on the cut side, shiny on top. It was ... ok. 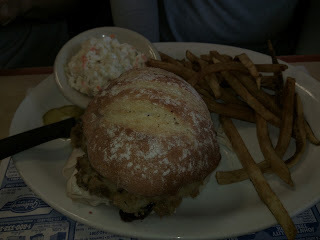 It kinda was like a cross between an English muffin and a dinner roll. It wasn't particularly flavorful, but was soft and moist. It was much better than the biscuit, and I covered it in gravy and Sriracha ketchup, and it was good enough. I wouldn't really want another one though. She also ordered the home fries again, even though she didn't love them the previous visit. She really wanted hash browns, or, something more flavorful. I told her she could order them with bits of onion and pepper mixed in, but, she didn't want that. As before, she seemed happy enough once she added a lot of salt and pepper to them. Like I said, good food, poor seasoning. Our final visit was to finally try the lunch menu. On a weekend no less. I knew that we'd have a long wait, and tried to encourage my family to go earlier, but, it didn't happen. We arrived around 12:15pm, basically, the worst time ever. The line went out the door, down the sidewalk. There were at least 6 parties ahead of us, all groups of at least 4, all needing a booth. Ooph. So, we waited outside in the quasi-rain. We watched through the windows as folks ate their brunch, and as people started to transition more towards lunch foods. We had plenty of time to study the menu, including the plentiful specials. A few counter seats opened up, but, since we were a group of 4, we really couldn't sit at the counter and all be able to talk. So we waited more. We planned our orders. And then, finally, all of a sudden, it was like the whole place turned over in the course of 10 minutes. The entire counter opened up. Booths opened up. We were all seated. There was a magic sweet spot of time to arrive in right there before the line built up again. The lunch food was ok, but, I likely wouldn't return for lunch, and would opt for breakfast instead. 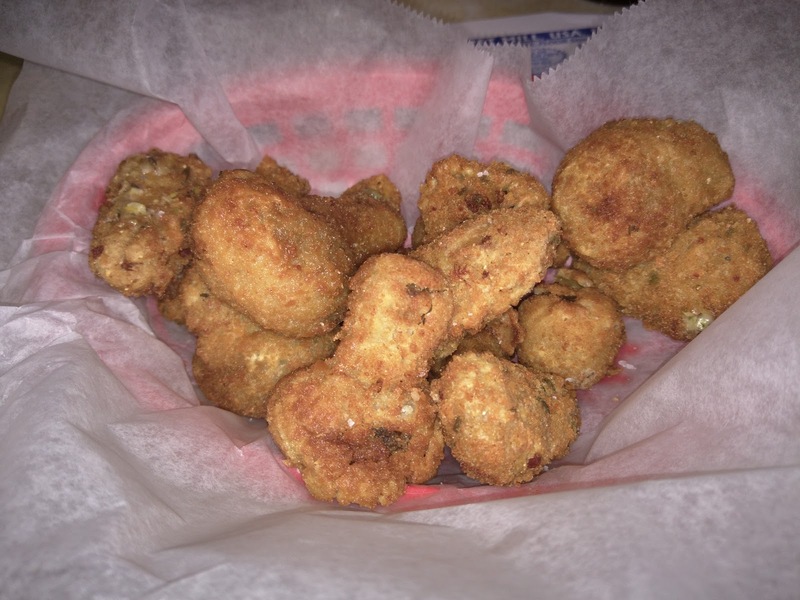 Fried Mushrooms and Jalapeño Cheese Balls. $4.99. On the specials menu were a few different fried items, all with fun sounding dipping sauces. We decided to order one for the table. What we ordered: "Fried Green Beans, Asparagus & Zucchini w/ Yum Yum Dipping Sauce". Between the three items, there was something that everyone was interested in. Also, how do you turn down "Yum Yum Dipping Sauce"? Around the time we expected our food to show up, our server came back and told us that they had fried mushrooms and jalapeño poppers instead, and asked if that was ok. We said ... sure, but, were far less excited. Our basket contained a bunch of fried balls. It wasn't entirely obvious which were which, although, the mushrooms did have stems. My dad doesn't like cooked mushrooms, so he worked hard to avoid them. I actually really liked the flavor of the mushrooms inside the batter, but, the coating did fall off, and they weren't really that well prepared. Still, the mushrooms were my third favorite item of the meal. The jalapeño poppers weren't really poppers. Each person who took one commented on this fact. Poppers are usually a jalapeño stuffed with cheese, right? These didn't have an actual jalapeño in them, instead, they were fried cheese balls, with bits of jalapeño mixed in. This wasn't a bad thing, as they were very hot balls of molten, spicy cheese, with a nice crunch from the breading on the outside, but, if you wanted a popper, these weren't it. I really liked the breading and the heat from the jalapeño inside. My second favorite item of the meal. When our basket was delivered, there was no sauce with it. After our server did not come back with more items, I flagged her down to ask about a dipping sauce. I suggested maybe the "yum yum" sauce? She returned with something, an orange-pink creamy sauce. Was it yum yum sauce? I have no idea. Was it meant to go with these items? No clue. But I love sauces. There was also fried green tomatoes on the menu with "boom boom dipping sauce" and previous fried special apps had "Smokey Red Pepper Ranch Sauce", "Smokey Horseradish Sauce", or "Red Pepper Chili Dipping Sauce", so, I'm honestly not sure what our dipping sauce was. It could have been any of these. It was creamy, and had some serious kick to it, so, I think perhaps the boom boom? I liked it, and it went really well with the mushrooms and the sweet potato fries. Overall, not quite what we had intended to get, but, decent fried food with likely a mayo sauce. Not exactly health food, I know. Gobbler Full House Sandwich Platter. $7.99 + $1.99 (platter). "Roast Turkey, Stuffing, Cranberry Sauce & Mayo on King Arthur Flour Roll." My sister opted for a "Full House Sandwich", the Gobbler. 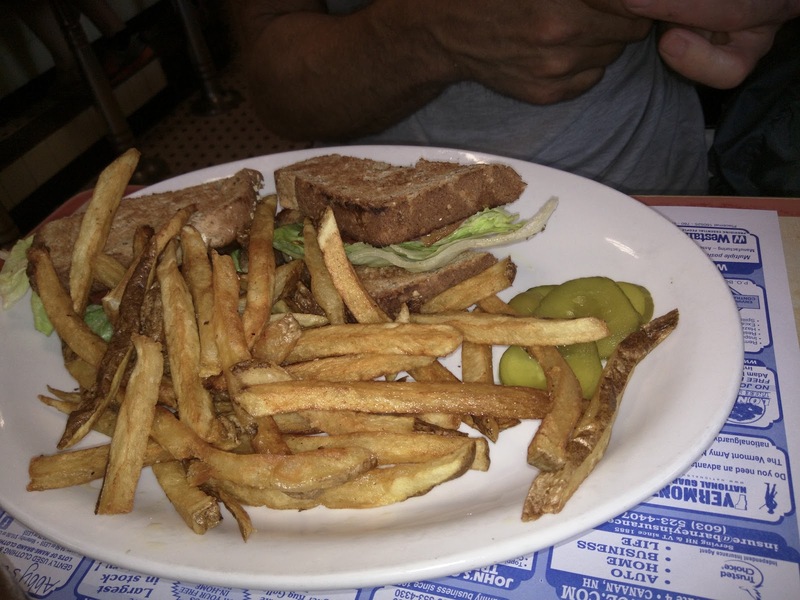 I think it normally comes with chips like the classic sandwiches, but, for $1.99 you can make it a platter with fries and cole slaw, which she did. I snagged a hunk of the stuffing from her sandwich, the component I most wanted. It was ... ok. Fairly basic stuffing, rather moist and mushy. It didn't have much flavor. Like many items, it was lacking seasoning. I had considered ordering a side of stuffing just because I love stuffing so much, but I'm glad I didn't. She seemed reasonably happy with her sandwich, but, she did say that the stuffing was too mushy. She only managed to get through half her sandwich. I also stole a few fries. They were fine, good flavor to the potato, skin on, but, a bit soggy, rather limp, certainly not crispy, and not very seasoned. I know it sounds like they had no redeeming qualities, but, somehow they weren't that bad, even though they really weren't that good. My sister also ordered a side of pickled beets, that didn't show up until well into our meal. I forgot to get a photo, but, it wasn't at all what she expected, as it was little cubes of beets, and, she claims they weren't really pickled. Classic Sandwich: BLT on Wheat Platter. $5.99 + $1.99 (platter). 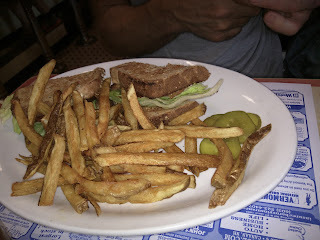 My dad, not much of an adventurous eater, went for a BLT on wheat bread. Classic sandwiches normally come with kettle chips and pickles, but, my dad opted to platter his too. His slaw did not arrive with his platter, and I pointed it out to him that he was missing it, so he mentioned it to the server, and it came soon after. So many missing components to our meal. I didn't try his sandwich, but, it looked like a pretty standard BLT. Not exciting in any way, but, why would it be? I did snag a few fries from him too, and they were again fine, although a bit limp and unseasoned. Fish & Chips, Small. $6.99. I had my eyes on the Fish & Chips, available in two sizes. 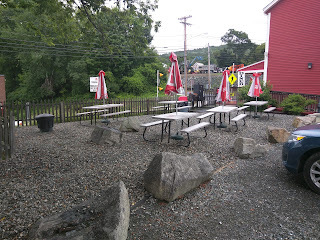 While I wasn't really certain the random diner would have quality fresh fish, I really do enjoy fish & chips when in New England because we don't have Atlantic cod (or haddock) in San Francisco, so, I risked it. 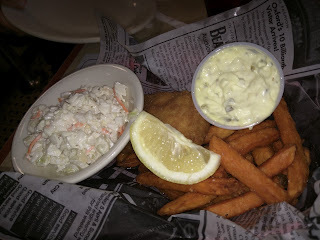 Fish & Chips is normally served with tartar sauce, french fries, and coleslaw (aka, as a platter), but I substituted sweet potato fries for the regular fries, because, um, sweet potato fries are better (I was surprised no one else in my family did too). The sweet potato fries were my favorite part of the meal. Like the regular fries however, they were not crispy. I also kinda wanted honey mustard to go with them, but the random sauce from the appetizer basket worked well enough. What they did have going for them was really excellent sweet potato flavor, you could really tell they were just chunks of sweet potato. I liked these, and would get them again, even considering having them with breakfast if I wanted a potato item, given the lackluster home fries. The cole slaw was the same as my dad and sister had, made from green cabbage and carrots. Interestingly, it was made with chunks of cabbage rather than the regular shredded preparation. It was really creamy, a bit overdressed, and, like most everything, entirely unseasoned. Literally, not a single speckle of pepper in it. I added some, and it got better, but, geez. I've never seen so much un-seasoned food before. It was fine, but I wouldn't get it again. The fish was a generic white fish, I'm not sure if it was cod or not. It was decent enough fish, flaky and moist. The breading wasn't very crispy though. It wasn't as limp as the fries, but, certainly not crispy like I'd like. And finally, the tartar sauce, always a key element for me. It was decent, loaded up with relish, some slight tang. I liked the sauce from our fried apps basket more though, and chose to dip my fries in that rather than the tartar. With the other apps the small portion was plenty for 2 people (my mom and I split it), but without apps, or dessert, it would make a fine meal for one. I wouldn't get it again though. The large size is $2 more, which I assume has another piece of fish.